Palystes castaneus, showing sparassid pattern of eyes in two rows of four, with the robust build and non-clavate pedipalps of a female. Members of the Sparassidae are native to tropical and warm temperate regions worldwide. A few species are native to colder climates, like the green huntsman spider (Micrommata virescens) which is native to Northern and Central Europe. Some tropical species like Heteropoda venatoria and Delena cancerides have been accidentally introduced to many subtropical parts of the world, including New Zealand (which has no native sparassid species). 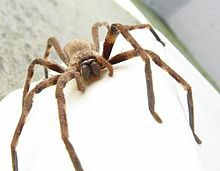 As adults, huntsman spiders do not build webs, but hunt and forage for food: their diet consists primarily of insects and other invertebrates, and occasionally small skinks and geckos. They live in the crevices of tree bark, but will frequently wander into homes and vehicles. They are able to travel extremely quickly, often using a springing jump while running, and walk on walls and even on ceilings. They also tend to exhibit a "cling" reflex if picked up, making them difficult to shake off and much more likely to bite. The females are fierce defenders of their egg sacs and young. They will generally make a threat display if provoked, and if the warning is ignored they may attack and bite. The egg sacs differ fairly widely among the various genera. For example, in Heteropoda spp. egg sacs are carried underneath the female's body. While in other species like Palystes and Pseudomicrommata spp., females generally attach egg sacs to vegetation. ^ a b "Family: Sparassidae Bertkau, 1872". World Spider Catalog. Natural History Museum Bern. Retrieved 2017-04-22. ^ "Currently valid spider genera and species". World Spider Catalog. Natural History Museum Bern. Retrieved 2017-04-22. ^ Norman Larsen. 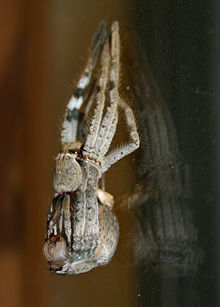 "Palystes (rain spiders, lizard-eating spiders)". Iziko Museums of Cape Town. Biodiversity Explorer. Retrieved 2 May 2010. ^ a b Geoffrey K. Isbister & David Hirst (2003). "A prospective study of definite bites by spiders of the family Sparassidae (huntsmen spiders) with identification to species level". Toxicon. 42 (2): 163–171. doi:10.1016/S0041-0101(03)00129-6. PMID 12906887. ^ Foelix, Rainer; Erb, Bruno (2010). "Mesothelae have venom glands". Journal of Arachnology. 38 (3): 596–598. doi:10.1636/B10-30.1. ISSN 0161-8202. ^ Rovner, Jerome S. (1980). "Vibration in Heteropoda venatoria (Sparassidae): A Third Method of Sound Production in Spiders". The Journal of Arachnology. 8 (2): 193–200. JSTOR 3705191. ^ Lissner, Jørgen. "Family: Sparassidae (Giant Crab Spiders)". The Spiders of Europe and Greenland. Retrieved 16 January 2018. .
^ Filmer, Martin (1997). Southern African Spiders. City: BHB International / Struik. ISBN 1-86825-188-8. Abdullah Bayram & Sevda Özdağ (2001). "Micrommata virescens (Clerck, 1757), a new species for the spider fauna of Turkey (Araneae, Sparassidae)" (PDF). Turkish Journal of Zoology. 26: 305–307. Wikimedia Commons has media related to Sparassidae.